When I was younger and wanted to play guitar in a band, you needed a fairly large amplifier. No one was miking their amps except in recording studios. A Fender Deluxe Reverb was a good starting point. If you cranked it up, you could be heard over the drummer. It belted out 22 watts through a 12” Jensen speaker. It weighed in at 42 pounds. 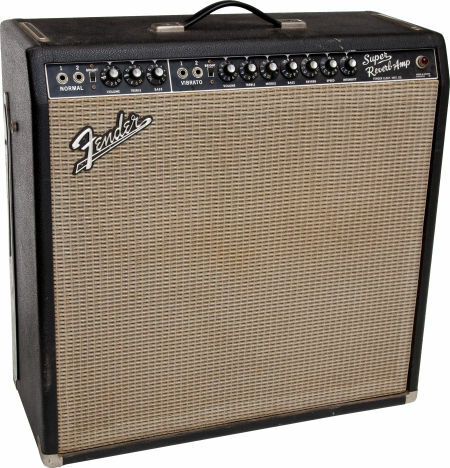 Even better was a Fender Super Reverb which cranked out a respectable 45 watts through four 10” Jensen speakers. It was bulky and weighed around 65 pounds. The Beatles were started using Vox AC30’s, but moved up to Vox AC100’s to be heard over the screaming girls. 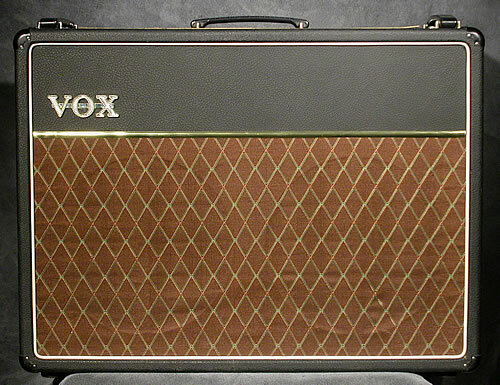 The AC30 cranked out 30 class A watts and weighed about 73 pounds. The AC100 Mk 1 put out 100 watts. It was a head only and weighed about 50 pounds. You also had to match this up with a Vox Mk1 speaker cabinet that contained four 12” Celestion/Vox Alnico speakers. It came with a tubular chrome plated trolley to help roll the heavy beast around, that is after you lifted it in and out a vehicle. 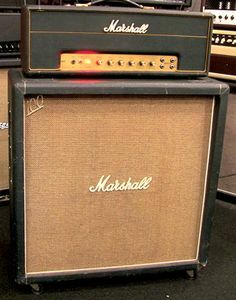 Then Hendrix and Cream, the Who and a slew of others discovered Marshall amplifiers; 50 watt JMP’s to be precise. Marshall originally, at Pete Townsend’s suggestion, packed the speaker cabinet full of eight 12” Celestion speakers. But soon found out this was way too heavy even for the largest of roadies. So Marshall devised the half stack; four 12” Celestions in each section. Much progress has been made in amplification. Some guitars prefer their tube sound, but solid state has really progressed and so has amplifier modeling. It is no longer necessary to lug around 100 pound amplifiers, when one can get a louder and more powerful sound through a much smaller amplifier. In 1999 Dr. Rick Jones, a telecommunications engineer who was also a bass player and was dissatisfied with amplification available at the time. In fact as far back as 1987 Jones became interested in improving amplification. He discovered Walter Woods’s amplifier heads and loved the sound. Walter Woods was probably the first person to create a “mini amp” that was powerful. His first design was produced in the 1970’s and called the Min Amp 1. It was a one channel prototype and produced 50 watts. Its design eventually morphed into the Mi 100. This amp was about as tall as a pack of cigarettes. It delivered 75 watts into 8 ohms or 105 watts into 4 ohms. The equalization frequencies are different for each channel. Through experimentation Woods was able to enhance the harmonics, which kept down the level of distortion and gave the amplifier an exceptional tone. By the 1980’s Woods developed the Mi 225. This was a class D amplifier that put out over 200 watts. The original model was a one channel unit, but was upgraded to a 2 channel amplifier. This amplifier featured a very complex design. In the 1990’s Woods improved upon his Mi 100 amplifier. The pre-amp was modified through the use of integrated circuits and mosfet transistors. By the mid 1990’s Wood had come up with the Electroacoustic series. The preamp is similar to the Mi 100, but the power amp section makes use of digital technology. These are also known as the M-450, which produces 450 watts into 8 ohms and 750 watts into 4 ohms or the M-800 which puts out 800 watts into 8 ohms and 1200 watts into 4 ohms, yet only weighs four pounds. Dr. Jones studied these amplifiers and came up with his own version called the Coda R. It was designed as a class D bass amplifier and produced a warm, dry transparent sound with a flat frequency. It featured a downward firing 10” speaker. Essentially the speaker was at the bottom of the cabinet facing the floor to bounce the sound. The amp was also equipped with a 5” midrange speaker and a 1” tweeter. It only weighs 5 pounds, yet produces 300 watts of power. 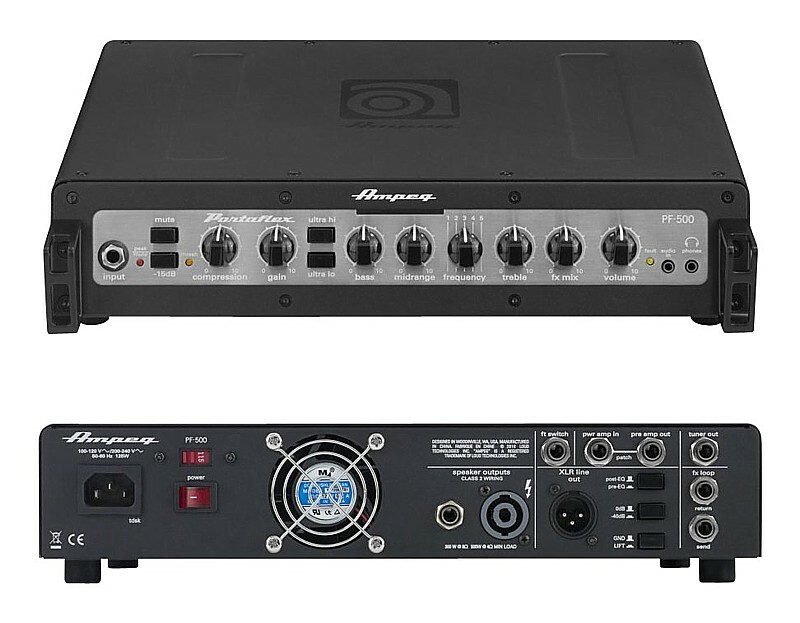 Acoustic Image makes several versions of its amplifiers. The S4 Clarus comes as a head in either a one or two channel version. It is 600 watts into 4 ohm speakers. 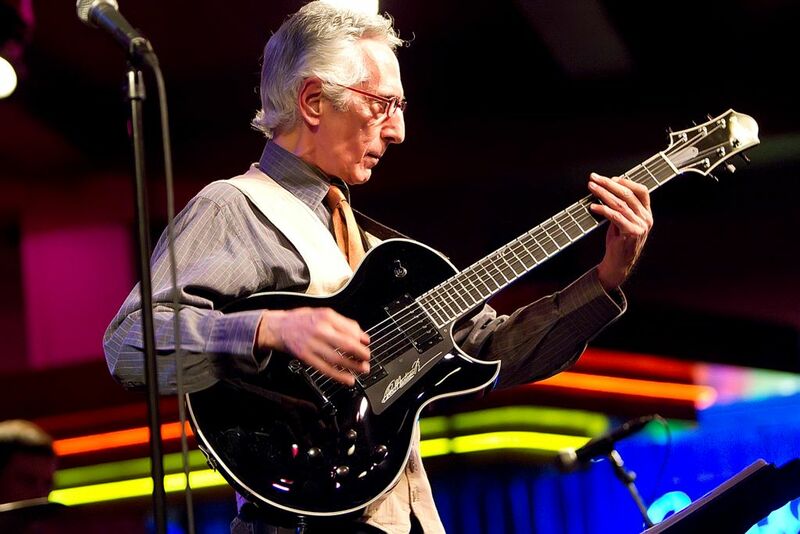 Jazz guitarist Pat Martino packs one of these for his gigs. The S4 TEN² has one downward firing 10” speaker and another forward firing 10” speaker. It also packs 600 watts into a 4 ohm load. Other versions include the Corus and the Contra. 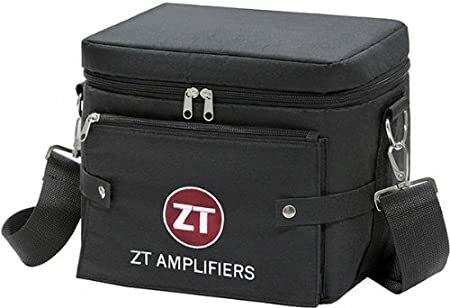 All Acoustic Image amplifiers are light enough and small enough to fit in a gig bag and be carried over one’s shoulder. Those amps are more for jazz players, but Matrix Amplifiers of the U.K. offers the Vintage British 800. This is an amp with some balls. This little brute pumps 420 watts into 4 ohms or 150 watts into 16 ohms and sounds amazingly like a Marshall stack. The preamp is tube or valve based. It utilizes digital modeling to achieve its Marshall quality tone through the use of class a/b mosfets (metal oxide semiconductor field effect transistors). This amp weighs in at only 4.2 pounds and easily fits into a gig bag. 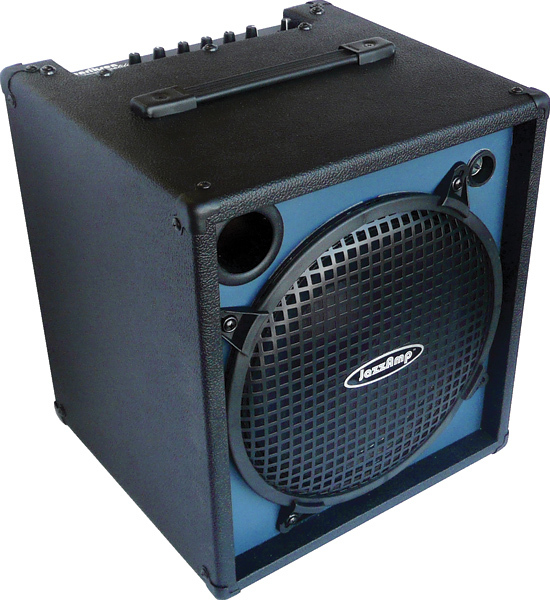 Matrix offer several light weight speaker cabinets to match up with the amp. One comes with one 12” speaker and the other comes with two 12’s and both are light enough to carry with one hand. The amp sells for $749 USD. 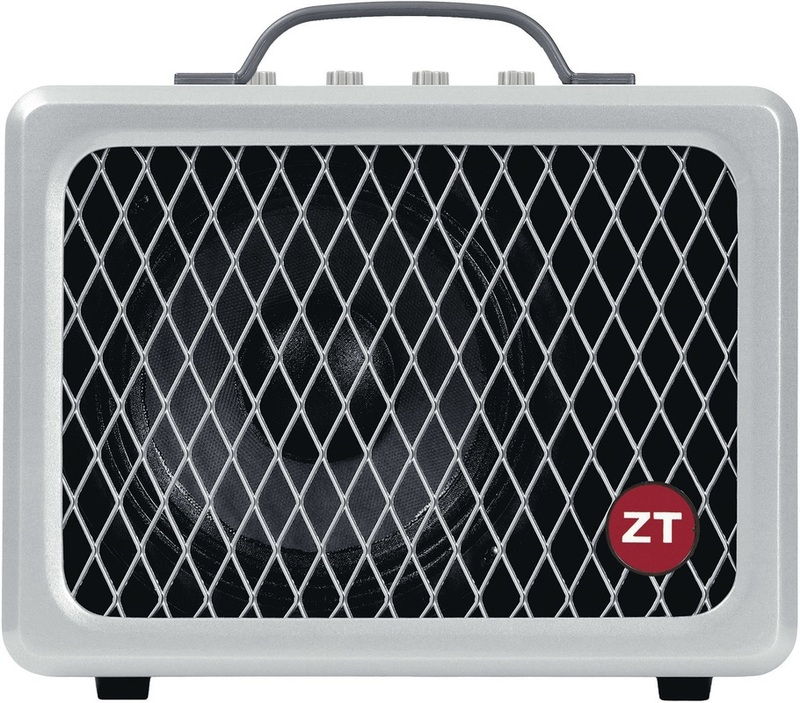 You may have seen the ZT Lunchbox offered at your local music store. This amplifier comes in several different combinations. The most popular version cranks out 200 watts into a 6 ½ inch speaker while only weighing 9 ½ pounds. It sell for $299. You can get an optional gig bag. There are controls for volume, gain, tone and ambience, which is mimics open back cabinets. It comes with a line out/headphone port, an external speaker output, and a switch to disable the onboard speaker. This unit sells for around $300 USD. 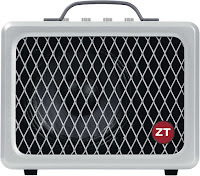 ZT offers the Lunchbox acoustic model. Instead of metal housing, this amp is enclosed in wood and comes with two channels. One is a microphone channel which enables this unit to be used as a small PA system. It too offers 200 watts of power into a customer ultra-high 6 ½ inch speaker. The mic channel has an optional XLR input and a 1/4'” input. The instrument channel has a ¼” input and both have their own dedicated gain controls. The amp has a built-in plate style digital reverb. It has an effects loop and a phantom power supply. Like the original Lunchbox it has an external speaker output and a switch to disable the internal speaker. This amp sells for $399 USD and weighs a mere 12 pounds. 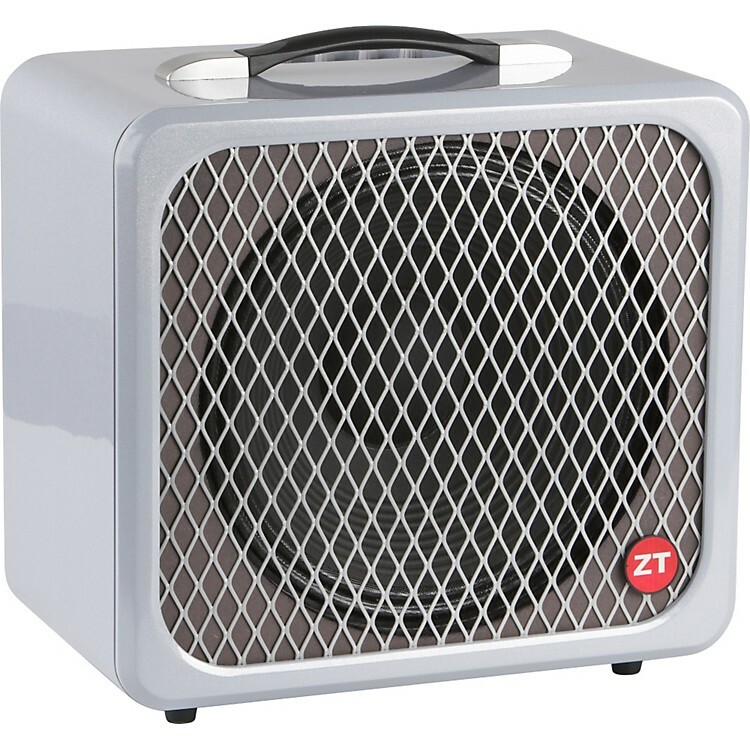 ZT Lunchbox offers a version of the original but with a larger 12” speaker. It also pumps out 200 watts and weighs 22 pounds. AER is a German company that has been building acoustic guitar amps for quite a while. There are many artists that use these amps based on their transparent sound quality and size. Most of the amps weigh between 13 and 14 pounds and produce 40 to 60 watts of power into their internal speakers. The line-out allows the amp to be used as a monitor, while the signal is fed into the house sound. Now recently AER has manufactured a line of amplifiers for electric guitars. 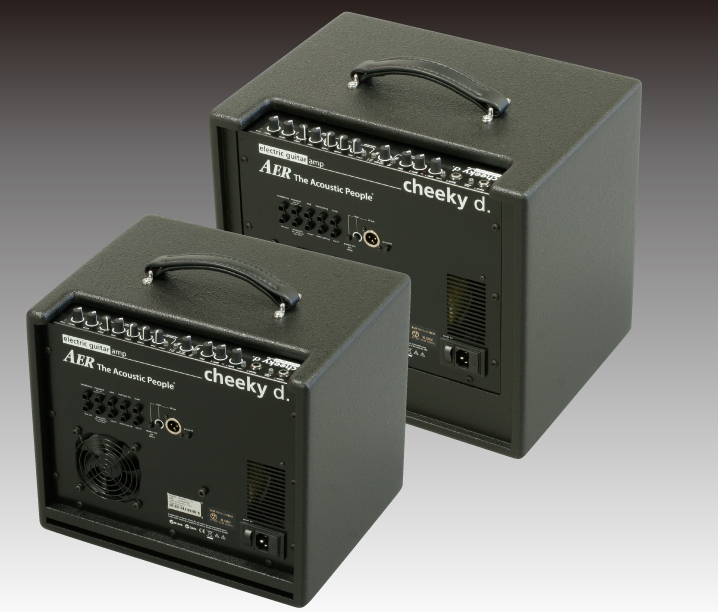 The Cheeky D produces 200 watts of power into your choice of a 10” or 12” speaker (which boast 240 watts). The amplifier has an input for a clean sound and another for a distorted sound. 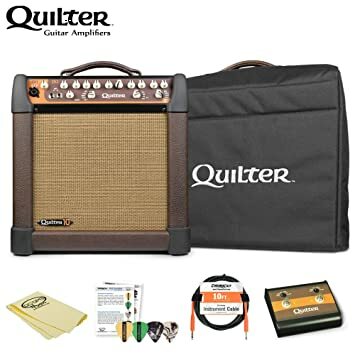 It comes with 2 gain controls and a distortion control, a master volume control, equalization controls and built in effects (reverb, chorus, delay) and comes with its own padded gig bag and weighs about 35 pounds. 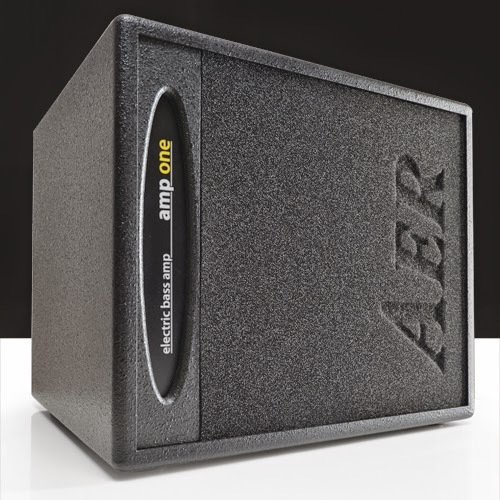 AER also offers a bass amplifier simply called Amp Two. It pumps 240 watts into a 12” speaker and a 4” midrange speaker. 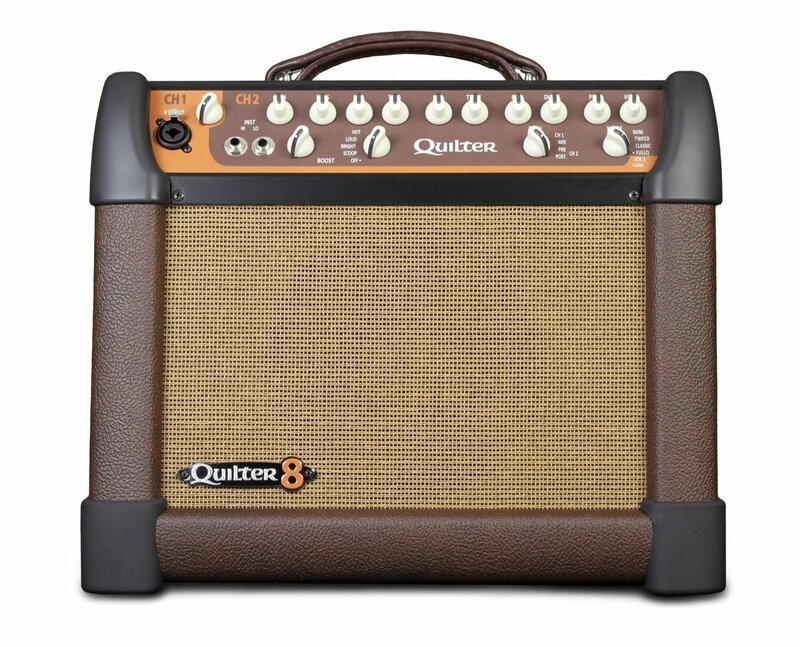 This amp features a compression control, 3-band equalization, a mid-cut/treble boost control. It comes with a padded cover and weighs about 52 pounds. 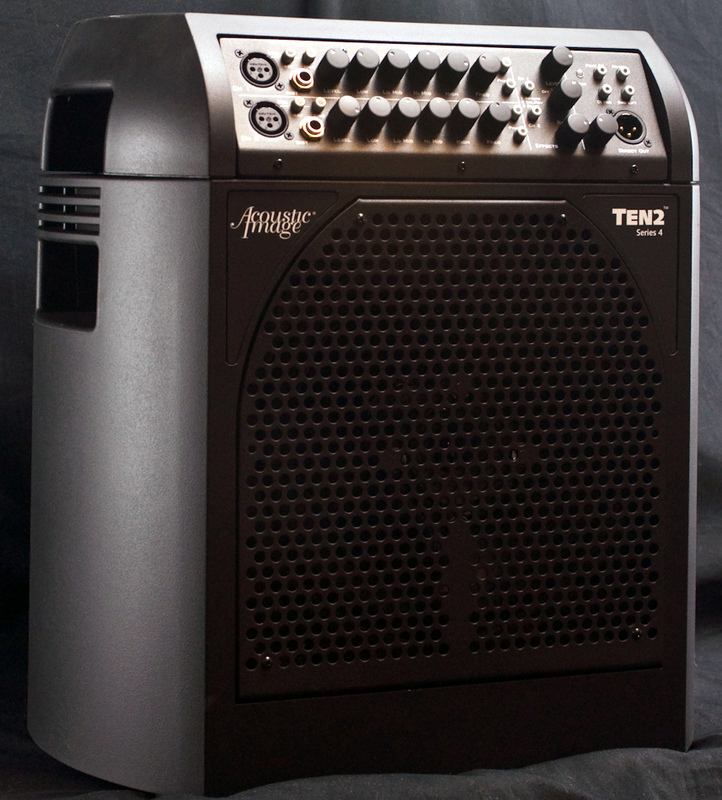 They also offer Amp One which is a bass amp with similar features that puts out 200 watts into a single 10” speaker. It weighs around 30 pounds. AER’s upgraded version of Amp One is called Amp Three. It is very similar to Amp One, and pumps 200 watts into twin 8” bass drivers. It also weighs around 30 pounds. 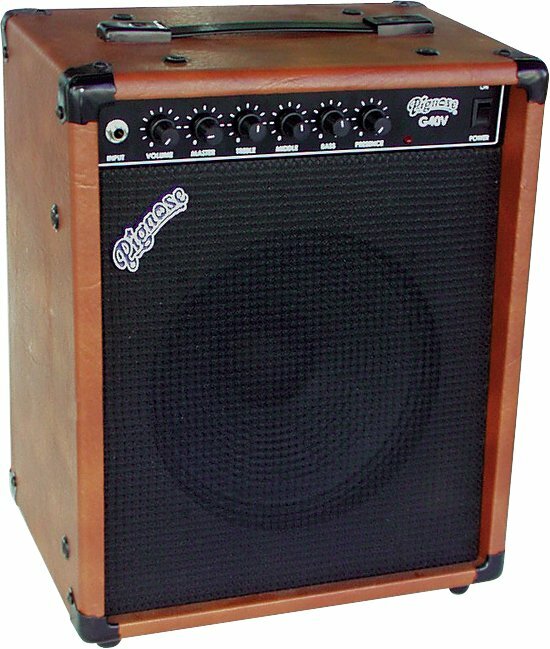 Although the Pignose G40V amps are no longer in production, they can still be found for sale on the internet. This amplifier was designed by New Jersey amp designer and repair man Dennis Kager. The circuit is based on Fender’s Tweed - four 10 Bassman amp and it cranks out 40 very loud watts into a 10” speaker. The speaker is rated at 80 watts, so it can handle the load. The control panel consists of volume, gain volume, treble, middle, bass and a presence control. For a small amplifier, it can really get loud. And if you like a distorted gnarly tone for playing Blues, this amp will get you there. And yet it only weighs 28 pounds. It has a solid state rectifier, but the preamp section consists of three 12AX7’s and the power amp section if two 6L6 tubes in a class a/b format. This amp came out in the late 1990’s and at the time no one liked it because it was made in China. Today, many well known amp manufacturers are outsourcing production to China, so you no longer have the stigma. Another amplifier that is no longer produced was the Crate PowerBlock. These can be found as used equipment on various web pages and sell for $150 to $200 USD. The PowerBlock is rated at 75 watts stereo or 150 watts monaural. It is a 10” x 3” unit that weighs only 4 ½ pounds. I am told this is a clean amp. For distortion you will need a pedal. Electro Harmonix produces an amplifier that looks like a guitar pedal. In fact it can be mounted on your pedal board. This is the 44 Magnum. This little pedal produces 44 watts of power into an 8 or 16 ohm speaker load. The effects are minimal; just a volume knob and a switch that toggles between a normal setting and a bright setting. It sell for around $151 and fits in the palm of your hand. In fact you can put it in your guitar case or gig bag. 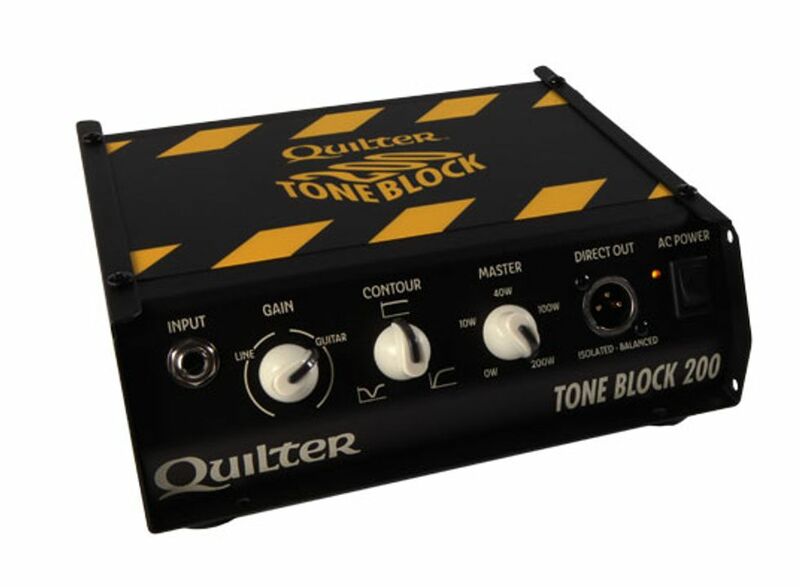 A newer amplification company out of Costa Mesa California called Quilter has come out with their version of the “PowerBlock” which the call The Tone Block. This minimalistic amplifier weighs only 4 pounds yet puts out 200 watts into 4 or 8 ohms. The control panel features gain, contour and a Master knob that determines the output; 0 watts, 10 watts, 40 watts, 100 watts or 200 watts. Quilter also markets a line of Micro Amps called the MicroPro 200 series. These amps are similar except for the speaker size. They all are 100 watts per channel or 200 watts when using both channels. They are ultra light and can be matched up with an extension speaker. They can weigh anywhere from 19 pounds to 27 pounds depending on the speaker size. They come with an 8”, 10” or 12” speaker or as just a head that can be matched up to their 12” speaker cabinet (30 pounds for the cabinet). They have also come out with a second generation of these Micro Amps. All fit into a handy gig bag for easy transport. Heriksen amplifiers are designed by Bud Heriksen and are small, light weight amps that pack a punch. The Bud will not be available until late February 2015. It comes in a 9” x 9” x 9” cabinet and produces 120 watts of analog power into its built-in speaker and weighs a mere 17 pounds. 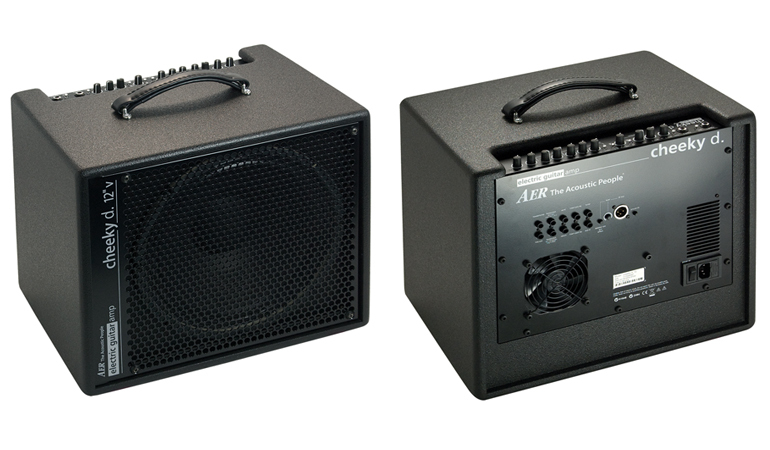 The Jazzamp 110 and 110 ER can produce up to 160 watts into a 4 ohm speaker load. It comes with a built-in 8 ohm speaker and cranks out 120 watts. The controls are a single volume control and five controls for equalization. It has built-in reverb. The amplifier is 14” x 14” x 8” and weighs only 23 pounds. The ER version includes a small tweeter speaker to bring out the highs. The Jazzamp 112 and 112 ER are similar to the 110 model but come with an internal 12” speaker. The controls include volume, a 5-band graphic equalizer, reverb with on/off switch and wet/dry mix control. This amp too is 160 watts into a 4 ohm load, and 120 watts into the internal 12” speaker. Once again the 112 ER versions include a small tweeter. 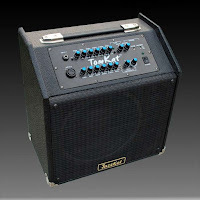 I’ve seen some local players using the JazzKat “TomKat” amplifier. This little amplifier produces 200 watts into its internal 10” woofer and 1” dome tweeter. It is fully equipped with external speaker jacks, send and return jacks, a headphone/line-out jack, and an array of digital effects. It weighs a mere 16 pounds. Lately there has been a real boon in small, but powerful bass amplifiers. This trend was started by Gallien-Krueger as far back as 1969 when Robert Gallien began work on the GMT 226A, a small bass amp, housed in a metal enclosure. It was the most powerful bass amp of the day. Next the GMT 200G became the first guitar amp with channel switching. 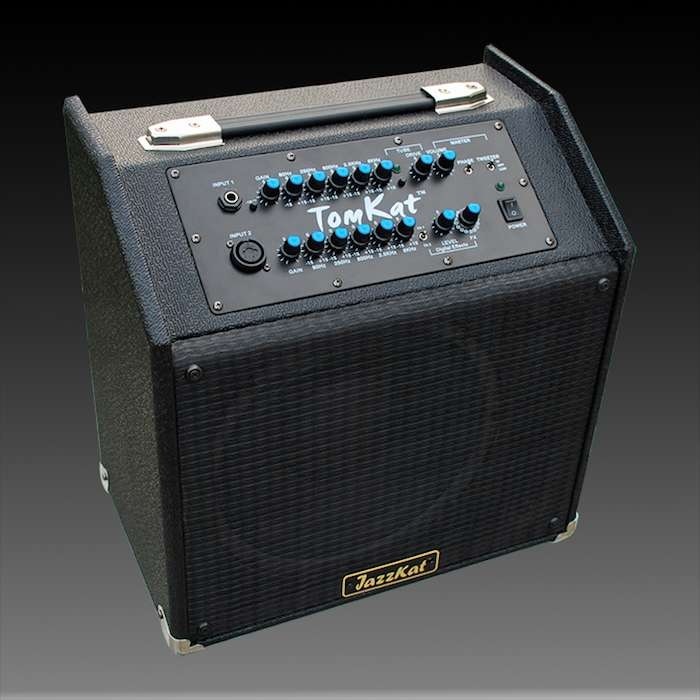 The GK 400B became the first bass amp with a contour control. 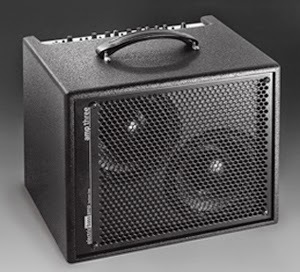 The GK200RB became the first rack mountable guitar amplifier. Then came the GK800RB, which was a hit in the 1980’s. But it was the GK 250ML put 100 watts of stereo power into a lunchbox size housing that showed guitarists that an amp did not have to be large to be powerful. Recently GK has come up the rack mountable MB500. It weighs a mere 4 lbs, but delivers 500 watts of power and tone in a compact unit. It comes with 4-band active equalization and a contour control. This amp has an XLR direct out with pre/post EQ selector and a ground lift. It has a tuner out with a mute, FX loop, headphone/line out and dual speaker outputs. This little beast pumps out 500 watts into 4 ohms or 350 watts into 8 ohms. Fender has not lost anytime in reducing their bass amp into a small package. 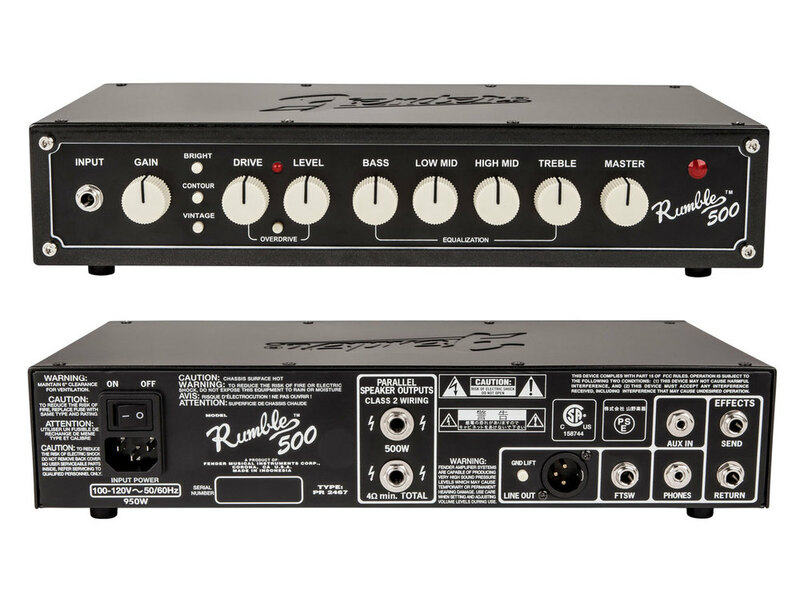 Weighing only 5 pounds, the Rumble 500 delivers 500 watts into 4 ohms or 350 watt into 8 ohms. This single channel amp includes an overdrive circuit and a 3 button voicing section that provide bright, contour and vintage sounds. It comes with four tone controls and two speaker outs. Additionally it has a XLR out. 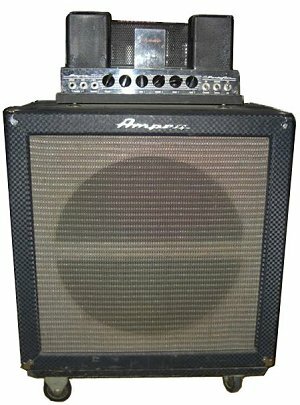 Ampeg’s Portaflex B-15 bass amplifier was the industry standard for years. 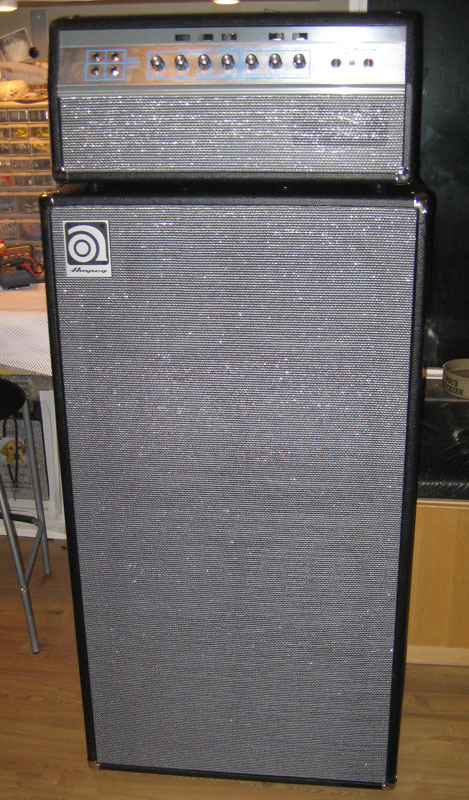 Then Ampeg’s design team came up with the SVT amp. This was the ultimate in bass power, but it was huge. The head weighed 80 pounds and the eight – 10” speaker cab weighed a back-breaking 165 pounds. But now Ampeg has shrunk their amp head to a 14” unit that weighs only 11 pounds, yet it delivers 500 watts of class D power and they call it the PF-500. The tone stack on the PF-500 provides an extensive array of tone controls for shaping your sound. Bass, mid, and treble controls come standard with a 5-position mid switch for finding the perfect midrange level for your sound. Ultra Hi/Lo boosts add even more on-the-fly options, and it is equipped with an onboard compressor. The optional speaker cabinets weigh anywhere from 45 pounds to 73 pounds. These PF cabinets give you option to attach your amplifier to the top and when the gig is over, the top flips over and provides storage for your amplifier inside the speaker cabinet just like the original Ampeg Portaflex amps. 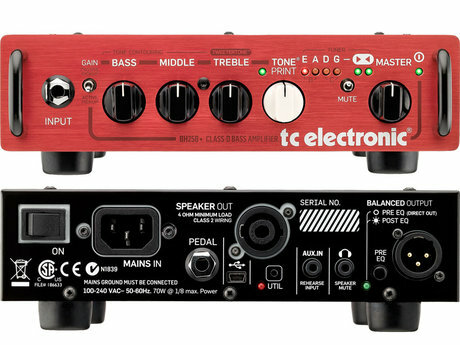 TC Electronics has a great series of micro bass amps with tons of power. The BH250 Micro head cranks out 250 watts of power yet weighs a mere 4 pounds. This amp has a built-in tuner and the unique Tone Print feature. This allows you to download dozens of free artist-created effects via apps on your iPhone, Android or computer by choosing the app and aiming the device at your guitars pickups. Within seconds the tone is now on your Tone Print knob. The rear panel features a plug n’ play input that can be connected to an iPhone or Android to play along with prerecorded tracks. There is also a speaker mute and an XLR out. The optional floor pedal allows you to access up to two Tone Print effects. The BH550 is a 500 watt version while the BH800 is an 800 watt version of this amplifier both amps come with 2 Tone Print knobs. So you can store twice as many effects. Both of these amps only weigh 9 pounds, while the BH250 weighs 4 pounds. The TC Speaker cabinets come in different options and weigh around 40 pounds. I used to have a Kustom 50 watt amplifier. It was study, dependable and big. The amp was enclosed in black tuck and roll naugahyde. The head probably weighed around 25 pounds. This was produced in the era when Bud A. Ross of Chanute Kansas owned the company. Kustom amps were solid state done right. In the 1980’s The Hanser Music Group of Kentucky acquired the brand. For several years the company produced the original tuck and roll amplifiers only these were tube based amplifiers. The company is now part of JAM industries. Kustom has dramatically changed. 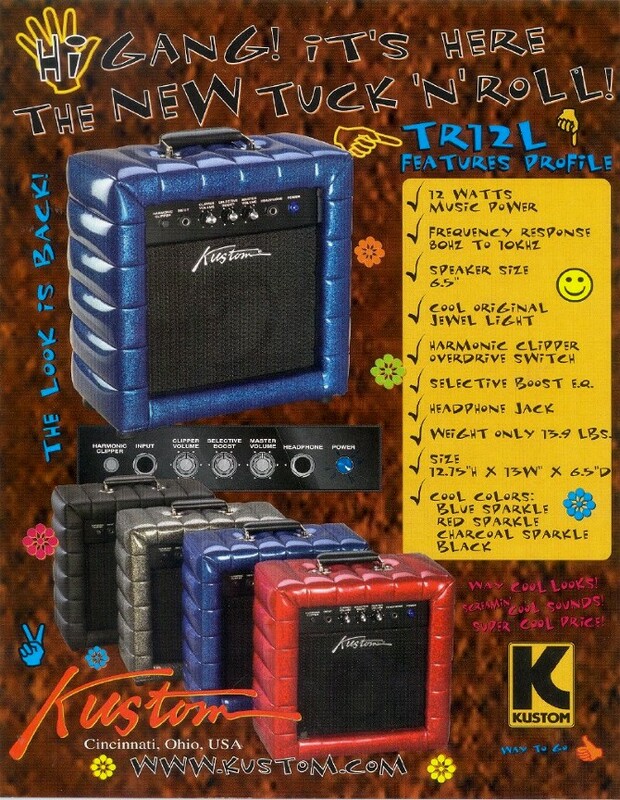 They still produce a variety of combo and bass amps; some even have tubes, but Kustom has come up with a light weight bass amplifier that delivers up to 450 watts in a 5 pound package. This is the KBX 500. It comes with a full array of features including an effects loop, tuner send, balanced line-out and ground lift pre and post EQ. Kustom also offers the KBX 200HR. This amp delivers 200 watts. It has a 6 band equalization and only weighs 14 pounds. Danh co tuong online trên web GameBai.Net để thử sức với nhiều cao thủ. Giao lưu học hỏi với nhiều bạn bè yêu thích choi phom online nhé. Sorry, I don't play chess. Quilter aren't a "newer company." I used to play with a guy who played thru a 50-watt Quilter amp with a Marshall cabinet that sounded like a Marshall -- in 1979. Quilter's been around a long time. Bought a half size guitar for my 8 year old son as a birthday present. The strings are tight and there is a replaceable one in case it got faulty since kids are not very cautious at handling stuffs. It's got the perfect weight so it makes it easier for kids to carry and the sounds are really nice. I love it when my son plays greenday's "Boulevard of Broken Dreams" with it. Now my son can fulfill his dream of becoming a rock-star. There is a chance you are eligible for a free Apple iPhone 7.
eToro is the #1 forex trading platform for new and established traders.